Bevan House with HOT TUB & FREE Wi Fi01982 570235work Self-cateringBevan House is a 3 bedroomed cottage which is comfortable and well equipped for up to 6 people. It consists of a master bedroom with a zip link king-size bed. A second double room and a third bedroom containing bunk beds. There is an oil fired heating system to keep you cosy in the winter and the sitting room contains a wood burning stove. The dining room also has a parkray fire. The kitchen and utility room is well equipped with a cooker, dishwasher, fridge, microwave, freezer and washer/drier. The family bathroom contains a large bath with electric shower over. There is also a downstairs toilet. The property also has a lockable garage for guests own use for bikes, camping equipment etc. large lawns for children to play and picnic table & barbeque available. 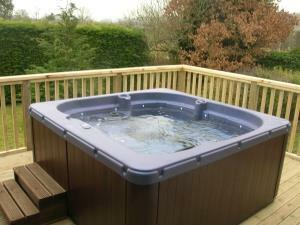 New decking area with Hot Tub for you to enjoy! 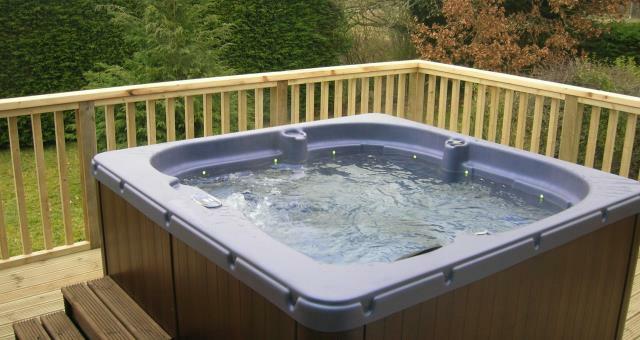 Hot Tub on decking just outside this luxury accommodation in mid Wales. The grid shows the prices and daily availability from Mon 22 Apr 19 to Mon 29 Apr 19. It's easy to check availability for particular dates; just use the calendar to choose the check in date, select the number of nights and click the 'Search' button. Click the Book Now or Book Direct button to book the highlighted days. With Book Now the unit booking will be confirmed immediately, with Book Direct the unit reservation will be confirmed within 24 hours..
Bevan House is a 3 bedroomed cottage which is comfortable and well equipped for up to 6 people. It consists of a master bedroom with a zip link king-size bed. A second double room and a third bedroom containing bunk beds. Minimum Booking is for 2 nights. Bevan House is situated amongst rolling hills. Hill walks and cycle tracks are easily accessible from property. Cot, highchair and barbeque are available on request. Children welcome from any age. From the Midlands take A44, then at new Radnor take A481 to Hundred House, Bevan House is on the right just past the village.